In today’s brief post, Marla Ahlgrimm answers common questions about thyroid disease, a hormone disorder that silently affects millions of women each year. Marla Ahlgrimm: Thyroid disease is a catchall phrase to describe disorders of the thyroid, a small gland that controls the body’s metabolism. The most common types of thyroid disease in women are hyperthyroidism, hypothyroidism, postpartum thyroiditis, and thyroid cancer. Q: How do thyroid problems negatively affect women? Marla Ahlgrimm: Women with thyroid disorders – which may be mistaken for menopause symptoms in women over 35 – may experience irregular menstrual periods and infertility. A pregnant woman with thyroid condition puts herself and her baby at risk for other health problems if her condition is not managed from the beginning. Q: What is the difference between hypothyroidism and hyperthyroidism? Marla Ahlgrimm: Hypothyroidism, also called an underactive thyroid, is when the body does not make enough thyroid hormones. In the US, Hashimoto’s disease is the most common trigger of hypothyroidism. Hyperthyroidism is often referred to as an overactive thyroid. 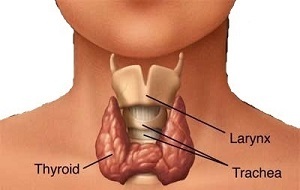 Hypothyroidism and hyperthyroidism affect the weight, causing weight gain and weight loss respectively. Q: How are thyroid diseases treated? Marla Ahlgrimm: Thyroid issues are treated depending on the kind of issue and the woman’s overall health. Hyperthyroidism is typically addressed with a combination of anti-thyroid medicines and beta blockers. Occasionally radio iodine or surgery may be necessary. Women with hypothyroidism are usually prescribed a man-made form of the thyroid hormones that must be taken every day. Thyroiditis is a condition that results in the chronic inflammation of the thyroid and is often treated effectively with hormone therapy. Women who experience postpartum thyroiditis may not require treatment as the body returns to normal between 12 and 18 months after giving birth. All thyroid diseases must be diagnosed by a medical professional, often in endocrinologist, who will prescribe medications, treatments, or recommend surgical procedures to circumvent major complications.